This beautifully designed tarot-sized Card Deck consists of 80 lovely cards - each card with a delightful, uplifting LOVE poem by RUMI, including a matching tuck box. Use this inspiring card deck to pamper yourself with a daily dose of an affirmative love poem which carries you through the day. By reading this touching love poems you are surrounded with loving energy and you might be able to find the Beloved within you and finally the glory of your own soul. Exceptional gift for yourself, your Lover, loved ones and friends. Jalāl ad-Dīn Muhammad Rūmī, more popularly in the English-speaking world simply as Rumi (30 September 1207 – 17 December 1273), was a 13th-century Persian poet, jurist, theologian, and Sufi mystic. He has been greatly appreciated for his spiritual legacy in the past seven centuries. His poems have been widely translated into many of the world's languages and transposed into various formats. In 2007, he was described as the "most popular poet in America." Rumi stands for Love and ecstatic flight into the infinite. Rumi is one of the great spiritual masters and poetical geniuses of mankind. He believed passionately in the use of music, poetry and dance as a path for reaching God. If there is any general idea underlying Rumi's poetry, it is the absolute love of God. Rumi lived a grand and illustrious life. He was a respected teacher, a master of Sufi lore, the head of a university in the Anatolian capital city of Konya (in present-day Turkey). At the age of thirty-four he claimed hundreds of disciples, the king being one of them. What is so remarkable and unforgettable about Rumi's life is that in one moment, when he met a wandering dervish or Sufi devotee named Shams-e Tabrizi on 15 November 1244, that completely changed his life. Rumi's entire view of reality changed. Shams' imparting of an inner awakening is what shattered Rumi's world. 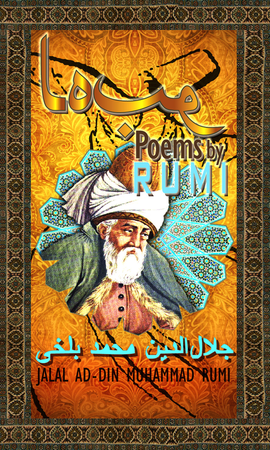 From an accomplished teacher and jurist, Rumi was transformed into an ascetic.The truths and assumptions upon which Rumi based his whole life crumbled..Shams represented the replacing of Rumi's book-learned knowledge (and his lofty regard for such knowledge) with divine knowledge and the direct experience of God. Rumi entered a mystical state of ego annihilation that the Sufis call fana. When he regained consciousness, he looked at Shams with utter amazement, realizing that this was no ordinary dervish, but the Beloved himself in human form. From that moment on, Rumi's life was never again the same. Shams catalyzed a profound experience for Rumi that transformed him from a dry academic to a mystic drunk with God. Shams enabled Rumi to encounter the divine reality that Rumi yearned for but until then had only known second-hand. He took Shams to live in his home and the two men were inseparable, as a Sufi tradition, they spent hours a day together, sometimes isolating themselves for long periods to pray and fast in divine communion with God. Rumi was totally lost in this new found love that his master revealed, and all his great attainments were blossoming through that love. Every day was a miracle, a new birth for Rumi's soul. He had found the Beloved, he had finally been shown the glory of his own soul. On the night of 5 December 1248, as Rumi and Shams were talking, Shams was called to the back door. He went out, never to be seen again. It is rumored that Shams was murdered. Shams left in the middle of the night and some accounts said, that Rumi wandered in search of him for two years - perhaps a symbolic and romantic portrayal of the lover in search of his missing Beloved. Without Shams, Rumi found himself in a state of utter and incurable despair; and his whole life thereafter became one of longing and divine remembrance. Rumi's emptiness was that of a person who has just lost a husband or a wife, or a dear friend. Rumi's story shows us that the longing and emptiness we feel for a lost loved one is only a reflection, a hologram, of the longing we feel for God - it is the longing we feel to become whole again, the longing to return to the root from which we were cut. It was Shams' disappearance, however, that ignited the fire of longing within Rumi. And it was this very longing that brought him the glorious union with the Beloved. Years later Rumi wrote: "It is the burn of the heart that I want. It is this burning which is everything - more precious than a worldly empire - because it calls God secretly in the night."